Here at DataSpace we are always looking at the different ways you store data and how we can make life easier. Making life easier for you also involves protecting the data you have. As all GP’s will know, the Lloyd George envelopes in which patient records are stored have, in recent times, come up against their fair share of problems. The paper based method in which general practitioners store their patient records enable details to be stored on a card that tucks into an envelope. However, in a time of stringent data protection, demand for chronological note order and lack of storage, has meant that these Lloyd George envelopes are fast becoming unmanageable. 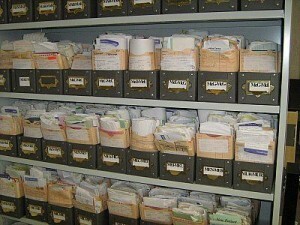 Imagine a patient’s medical records that span over 60 years. This can manifest in hundreds of pages, and that is simply for one patient. As a doctor trying to store and read through their patients notes it can be take up a lot of time and be very costly indeed. Consider the requirements for GP notes today. With so many concerns over litigation doctors are writing lengthier notes which require more space. There is also the issue of fire and theft. Any damage within a doctors surgery could mean that notes are gone forever. This is where DataSpace come in. Our Storage and Scan solution means that you don’t need to worry about storage space, data protection or theft or loss. This service involves us both physically storing your Lloyd George notes, as well as scanning them electronically. That way the original notes are kept safe and sound within our 24/7 protected off-site archive facility and an electronic copy is hosted and stored for your accessibility. This storage and hosting is in keeping with the BS5454 for physical storage and BS:27001 for the electronic hosting and scanning. So all storage is of the highest standard. What does this mean for your surgery? In terms of your practice it would mean more space, more time and far less costs overall. Here at DataSpace we would take care of it all for you, so you no longer have to locate patient files and can read them online in the comfort of your own surgery. To find out more about our Storage and Scan solution for Lloyd George envelopes why not contact us today on 0800 028 8956.